Technology has spread its wings in almost every sector, it has created value in every possible stream be it commerce, transportation, finance or any other. Education is one such dimension for which technology has still a great deal of value to impart to. Since the usage of smartphones and tablets has been increased, application developers are being at the zenith of their creativity to develop educational apps. IT Solutions and Services impart a greater significance to education industry in enhancing its efficiency, affordability and convenience. With the use of Smartphones, tablets and laptops the impact of technology on education has been manifold. Smart classes, web conference, online classrooms, e-learning processes have completely transformed how education was pursued. Today, students have become more proactive, they need visuals, classroom activity and more engaging sessions to completely understand the basics and remain engaged in the learning process. The new methods of learning given by technology his imparting knowledge to students the way they demand. IT has changed the job description of a teacher, she no more is the source of only knowledge but she is also the provider of learning materials, resource links, reference materials and methods of learning. E-Learning is only a single way in the numerous other ways in online learning. Currently, the latest trend is mobile technology and they are increasing their peripheral thus becoming a vital part of education. 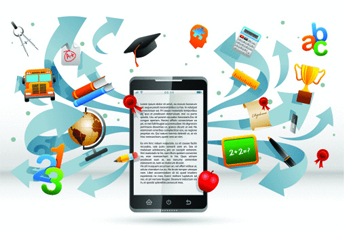 Mobile learning, a.k.a , M-Learning is knowledge on the go, it is always in your pocket, handy and accessible. This new learning methodology is more or less the result of the efforts put in by application developers and the mark of their creativity. The development of mobile learning tools is advantageous to students is several forms; they can easily revise what has been taught. Also, it is a better form of preservation of knowledge, students can use their mobile to share reading materials with friends, do an easy research on a particular topic and also to better utilize their idle time.